I took a lot of photos over Memorial Day weekend this year. Here’s a photographic recap. Scenes from Memorial Day Weekend 2011. 1. Oneida indians performing a traditional dance at the Native Circle Touch the Earth Festival at Mexico Point Park. 2. Interior of an 11th Century Manor House at Mexico Point Park. 3. Early evening fog obscuring the Power Plant in Oswego, New York. 4. Statue of Edward Austin Sheldon, teacher and educator, on the State University at Oswego campus. 5. Young boy in Indian Face Paint. 6. Play at home plate during a Syracuse Chiefs baseball game. 7. Veterans await the start of the Baldwinsville (NY) Memorial Day parade. 8. Fireman in full gear in the Baldwinsville (NY) Memorial Day parade. 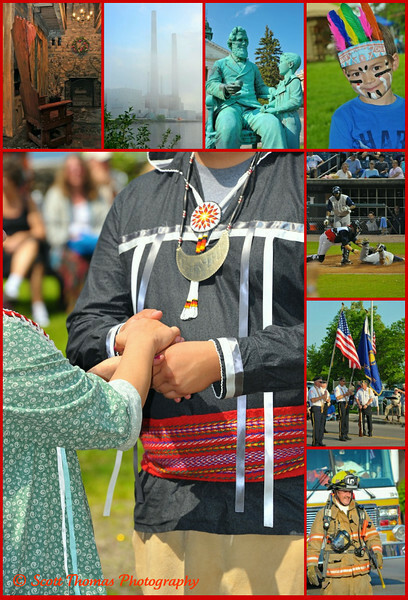 This entry was posted in Weekly View and tagged 28-300mm, baldwinsville, baseball, festival, fire truck, fireman, flags, holiday, memorial day, native american, new york, nikon D700, oswego, parade, syracuse chiefs, united states, vr. Bookmark the permalink. Nice use of collage. I am wondering about the small chest plate and the 11th c. manor house…11th c? Nice catch…to learn more about how an 11th century manor house ended up in upstate New York, visit this flickr page. My area, like yours, crams each weekend from Memorial Day until October with festivals and activities. So much fun…wish every weekend had three days. Not as busy as it looks, the events happened either in the afternoon or early evenings. I got in plenty of rest, too. Interesting is a good word for it, Robin. It sure was varied. No, you shouldn’t complain at all. I miss my summer vacations!